The end of the post-war multilateral world order based on cooperation and rules has been loudly proclaimed in recent years. And yet there is no robust evidence for it. The multilateral world order is certainly on the wane, but as of yet there is no new, dominant type of order. In short, there is an interregnum. In this Strategic Monitor we conclude that the international system is currently undergoing a phase transition between different system states. And that such a transition is characterised by unusual dynamics and events. The apparently conflicting dynamics in the international system can be interpreted through this prism. Freedom is decreasing around the world, for example, but for the moment the number of democracies remains unchanged. The principles of free trade are under pressure, but global trade volumes are growing. Interstate tensions have been rising for some years, but the ‘Long Peace’ between the major military powers has continued. At the same time, the trend analysis shows a predominantly negative threat assessment. Rather than improving, this is expected to worsen in the years ahead. International cooperation in the international order is declining. In most areas we are seeing a shift from cooperation towards conflict, accompanied by the systematic violation of rules and norms. This picture is not expected to change in the years ahead. Building on the multi-order concept presented in the 2017 Strategic Monitor, the years ahead are also set to see a hybrid world order which, depending on the domain and the subject, shows characteristics of a multilateral, polarised, networked or fragmented world. But overall, polarisation is gradually becoming more dominant. State and non-state actors will cooperate in different domains, to varying degrees and in changing configurations, or will clash. A differentiated foreign and security policy is therefore required. The Netherlands continues to operate in a context of international legal order. This is not only a goal in itself, but is also of great instrumental importance. If the norms and rules of this legal order are frequently violated, there will be increasing calls to bolster it. At the same time the Netherlands’ scope to project its values and norms will be much more limited. All these developments will put pressure on the traditional principles of Dutch foreign and security policy, including international cooperation in the EU and NATO as the primary multilateral arenas for the promotion of our interests. The Netherlands continues to rely on transatlantic cooperation for its security and stability and NATO remains the cornerstone of Dutch security and defence policy. Additional security cooperation in bi-, tri- and multilateral European contexts will above all be complementary. At the same time developments are making it necessary to seek new partnerships in the world outside these frameworks. This report identifies 45 middle powers with which coalitions can be formed in policy areas relevant to vital Dutch interests and values. In this security environment there is increasing emphasis on protecting and promoting the Netherlands’ own interests, including territorial defence of Dutch territory (together with the Caribbean parts of the Kingdom), allied territory and economic prosperity. Both ‘hard’ (e.g. military) capacities and ‘softer’ (e.g. diplomatic) capacities are of great importance in that regard. A robust and broadly based security policy is essential in this context. Finally, the high interconnectedness of security threats requires a policy in which different instruments of state power are deployed synergistically, not only in the internal-external security nexus but also across the different policy domains. At the same time the current dynamics strongly indicate that the international system is undergoing a fundamental transition. These include incidents in various areas that collectively amount to a broader, systemic trend: from the protracted Brexit negotiations, the continued tense relationship between NATO and Russia, declining trust in the usefulness of arms control as a means to promote strategic stability, the lack of progress in negotiations on a global climate regime, through to the internationalised conflicts in the Middle East, where various states are waging proxy wars over the heads of the civilian populations. The impact of the ongoing IT revolution, combined with recent breakthroughs in artificial intelligence, appears to herald a further transition. Among both elites and citizens there are dominant feelings of disquiet and uncertainty, despite the relatively favourable economic conditions in recent years. Nine out of ten respondents surveyed at the World Economic Forum expected an increase in “political and/or economic confrontations or frictions between the major powers”.﻿ On the basis of an opinion poll conducted among 154,000 people in over 145 countries Gallup reported that “collectively, the world is more stressed, worried, sad and in pain” than it has ever seen it.﻿ In short: something is going on. Through the prism of a system in a phase transition, these developments can be characterised as features of different system states that the world order occupies simultaneously. Although there are clear differences, these states are still manifestations of the same basic systemic design. Hence although cracks are appearing in the post-war multilateral world order, it is too early to write its obituary.﻿ Building on the multi-order concept introduced in the 2017 Strategic Monitor, ﻿ different international orders can be expected to arise in the various policy domains in the years ahead. The annual Strategic Monitor investigates and interprets developments in international relations and in our security environment and asks the following questions: what are the overall trends in the international system? What are the major threats? What is the situation with regard to the multilateral world order? In the Monitor we take stock of the world of today and of tomorrow. Our current assessment has already been outlined above. The following chapters provide further substance and detail. Following a brief explanation of the research approach in chapter 2, chapter 3 focuses on the geodynamics of the international system and describes global trends in cooperation, confrontation and assertiveness. Chapter 4 then deals with the trends in the threat assessment and the impact that these trends have on the Netherlands’ vital interests, on the multilateral world order in chapter 5 and on the role and position of the Netherlands on the world stage in chapter 6. The developments in the threat assessment and their impact on the Netherlands are examined with regard to two themes: international peace and security, and societal stability. These two themes are broken down in chapter 4. International peace and security is divided into interstate military competition, (Russian) political warfare and political violence on Europe’s external borders. Societal stability is divided into migration, the nexus between terrorism and organised crime and vertical tensions in Europe. Chapter 5 takes the two themes and considers how the degree of cooperation in the international order is shifting, with a focus on the concrete rules and agreements, as well as the underlying norms on which these are based. Chapter 6 addresses the Netherlands’ position on the world stage, based on an assessment of the particular role of middle powers, a survey of Dutch partnerships and a prospective analysis of the European Union and NATO. After considering these three factors, chapter 7 draws conclusions about the direction in which the threat assessment and international order are moving and identifies the dominant dynamics. This provides a basis for detecting the contours of a possible new world order (or orders). Finally, this chapter outlines some of the possible implications for Dutch foreign and security policy. The research activities conducted for this Strategic Monitor 2018-2019 led to the publication of 15 individual in-depth studies in various sub-areas.﻿ This synthesis report provides an overall framework in which those studies’ individual results (which are of value in their own right) are considered both in summary form and in their overall context (see Table 1). The 15 in-depth studies provide further background, data, analysis and depth, as well as references to the literature. They thus provide the body of evidence for the insights that are provided here in more concise form. The quantity of notes appended to this synthesis report has therefore been deliberately limited. Vertical Tensions: Coming Together or Falling Apart? The annual Strategic Monitor investigates and interprets developments in international relations and in the global security environment. The Monitor takes stock of the world of today and of tomorrow. The research is structured around the following question: What have been the main developments in the past 10 years with regard to international peace and security and societal stability and what trends are in prospect for the next five years? What is the expected threat assessment for the next five years, divided into the two themes of international peace and security and societal stability? In which direction is the international order developing, divided into the same two themes? What is the (best) position for the Netherlands in the world of today and tomorrow? Geodynamics. 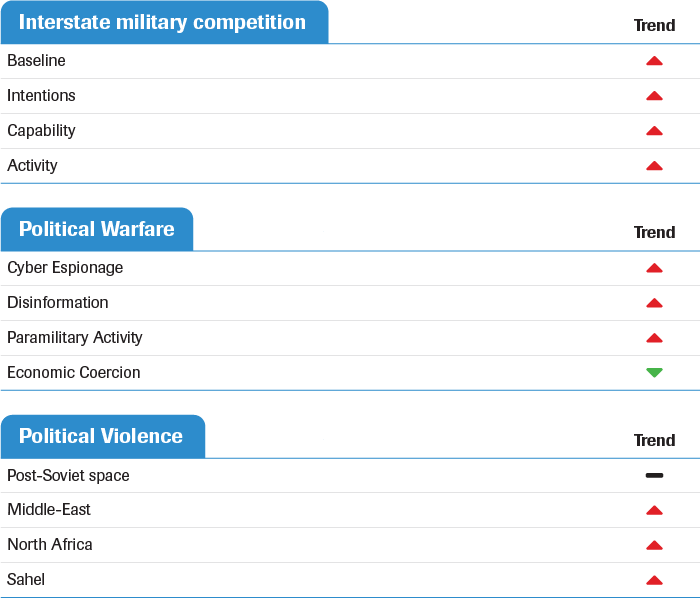 First of all the Monitor provides a structured overview of the global trends in cooperation, confrontation and assertiveness of state actors in the international system to assess a number of more general developments. This is done on the basis of economic, legal, military, political and social indicators, drawing on both structural and automated dynamic event datasets. A multilateral world: This involves continuing globalisation. Multilateral agreements and rules can adapt well to the shifting global power relations. The West still occupies a strong position, alongside emerging countries such as China and India. A world of networks: This involves a non-polar world order. A varied range of non-state actors dominate the world both economically and politically. These actors play an important role in transnational networks. States lose autonomy and significance due to globalisation. A fragmented world: Here it is anarchy that dominates. The lack of international leadership and functioning international institutions gives rise to conflict and rivalry in relations between states. States’ own interests, nationalism and retention of identity are the driving forces in the international system. There is no cooperation. It is a conflictive, insecure world of fragile, inward-looking states. Foresight studies such as this Strategic Monitor are conducted regularly, particularly in the Anglo-Saxon world. Three of them are briefly summarised below. Compared to this Strategic Monitor, these reports look further ahead (to 2035) and have a much broader, even comprehensive scope that includes monitoring and analysis of all policy themes. This is possible thanks to the scale and wide participation of policymakers and academics from home and abroad. The Strategic Foresight Analysis 2017 report of the Allied Command Transformation builds on the previous reports from 2013 and 2015. It describes the future that NATO expects to see unfolding up to 2035. To that end it looks at the global trends in politics, society, technology, economics and ecology, both individually and in their mutual relationship. In the political field the authors highlight fundamental changes in the international security environment, such as growing rivalry between the major powers, leading to new arms races. In the social field the authors believe the future will be determined particularly by asymmetric demographic changes, rapid urbanisation and polarisation in societies. Global Trends: Paradox of Progress by the US National Intelligence Council also looks forward to 2035. This report expects increasing tensions both within and between countries in the next five years. It draws attention to the fact that an ever growing number of states, organisations and private individuals are operating geopolitically and using instruments of power to achieve their goals. The report marks the end of the post-Cold War era of American dominance and of the rules-based international order that arose after the Second World War. The authors believe it will be more difficult to cooperate internationally in future. They even speak of “veto players” who will threaten to block cooperation at every turn, while “echo chambers” undermine a shared understanding of global developments by promoting numerous competing realities. In the meantime, the authors believe that states will remain both relevant and dominant in the future. Global Strategic Trends: The Future Starts Today by the Development, Concepts and Doctrine Centre (DCDC) of the UK Ministry of Defence also looks forward to 2035. The report analyses the main trends in five areas (environment and resources, human development, economics, industry and information, governance and legislation, conflict and security) viewed through a lens with four alternative visions of the future (multilateralism, multipolarity, network and fragmentation). The trends which, according to the authors, require immediate action by policymakers include climate change and resource scarcity, urbanisation and threats such as the nexus between extremism and criminality and the proliferation of weapons of mass destruction. The picture resulting from the analysis is mixed and in some respects more positive than those presented by most monitors in this genre: the balance between the ‘positive’ (green) and ‘negative’ (red) geodynamic developments improves over time in various areas. Most striking, perhaps, is the geoeconomic category, where the analysis for the past 10 years shows a number of improvements (see Figure 1). For example, the global poverty gap narrows over the period as a whole despite the economic upheavals in past decades and life expectancy continues to rise. 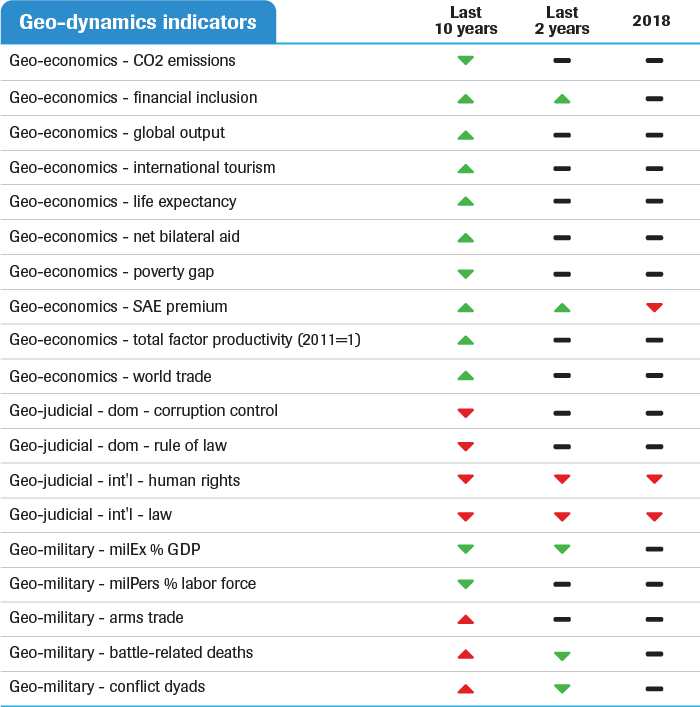 The picture in the geopolitical and geomilitary categories is more mixed than in the geoeconomic category. 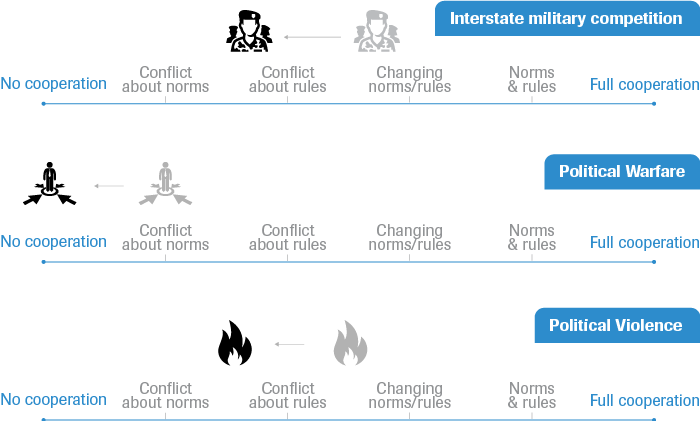 Here the number of actual conflictive events in the military field increases while countries are also behaving increasingly assertively, but there is – and according to some indicators even growing – cooperation in other fields (see for example the ratio of conflict to cooperation for the most recent period in Figure 2). In a number of other categories (see Figure 1 and Figure 2) there is a larger number of more negative trends. This applies particularly to the geosocial category. A point of concern is that many regions are moving away from the values of post-modern Europe. Mutual social trust is diminishing in most regions of the world. That decrease is associated with a reduction in secular and progressive values. Similar trends are evident in both the international and the geosocial and geojudicial categories. The latter trend is negative in countries with lower-middle and low incomes, but positive for countries with higher-middle and high incomes. A geographic breakdown shows that the rule of law is only stronger in Europe and Central Asia, whereas in all other regions the trend is negative. Viewed slightly differently, these developments can be seen as symptoms of a phase transition in which there is ideological divergence. The bottom-up social fragmentation in particular is both remarkable and disturbing. This chapter reviews the main developments in the threat assessment for the Netherlands and Europe over the next five years, focusing on the themes of international peace and security and societal stability. In addition to this increase in interstate military competition and political warfare, political violence on Europe’s external borders continues to rage. The different flashpoints in neighbouring regions such as the Middle East, North Africa, the Sahel and former Soviet Republics are spilling over to Europe and the Netherlands. Political violence in these areas comes in various guises, is perpetrated by various actors and has a wide range of causes, but it has increased in all regions since 2010. A continuation or an increase in political violence is expected in the Middle East, North Africa and the Sahel in the years ahead. The former Soviet republics, where there are often ‘frozen conflicts’, are seeing fewer outbreaks of violence. The outlook here is therefore predominantly and cautiously more positive than those for the other three regions. Migration is a divisive issue in the EU and European societies.﻿ The trend analysis shows that, despite the recent fall, the irregular influx of asylum seekers and migrants to Europe will likely rise again in the next five years. Structural factors, such as political conflicts and violence on Europe’s external borders, corruption and maladministration in the countries of origin and a better economic outlook in Europe, remain the driving forces of migration flows. The threat resulting from the nexus between terrorism and organised crime also remains high. In particular the risks associated with the return of jihadi fighters from Iraq and Syria and the associated challenges in the field of social reintegration and the dissemination of knowledge, experience and contacts within prison populations are high and increasing. It must be said that the authorities’ fight against the two related phenomena has been very fragmented. With regard to the vertical tensions between the population and the political-administrative elites in the Netherlands and the other European member states, the Netherlands in particular has seen confidence in the future increase in recent years. Improved economic prospects appear to be a factor in the increase. The picture across Europe as a whole is less rosy. Moreover, the mistrust in national governments is associated with mistrust in the EU and in the European institutions. This is expected to neither improve nor deteriorate in the years ahead and will remain a cause of friction, both within the societies and within Europe. The trends in the field of international peace and security show a predominantly negative picture. With regard to interstate military competition, (Russian) political warfare and political violence on Europe’s external borders, most indicators for the next five years point to an increased threat. The picture is also somewhat more positive in the field of societal stability, particularly with regard to the vertical tensions between the population and the political-administrative elites in the Netherlands, but not in the other European member states. In the field of migration, and even more in the nexus between terrorism and organised crime, key indicators point to a continuation of the trend (migration) and an expected increase in the threat (terrorism-organised crime nexus). This chapter examines the main developments in the international order over the next five years. Once again, this is done for the two themes of international peace and security and societal stability. An analysis of the different regimes shows a clear shift from cooperation to conflict at state level (see Figure 5). There is more conflict on the rules in the area of interstate military competition, little or no cooperation in the area of political warfare, conflict on rules, and an erosion of norms in the area of political violence on Europe’s external borders. In the first place there is a versatile system of multilateral treaties and organisations (or regimes) in the field of arms control. There has long been a normative consensus here, a clear set of rules (with verification mechanisms) and a high degree of compliance with these rules. But the cracks in these regimes have become increasingly clear in recent years. Support for norms is decreasing; rules are being violated, as in the case of the Conventional Forces in Europe Treaty; and treaties are even being denounced, such as the Intermediate-range Nuclear Forces Treaty. This is both a consequence and a cause of the increasing disunity among the main military powers. In addition, there is still no new set of norms and rules in sight to regulate emerging technologies in the fields of cybersecurity, autonomous weapons and other systems and artificial intelligence. In the field of (Russian) political warfare a major point of contention is the use of hybrid instruments, such as secret service operations, as an accepted means of influencing political decision-making in other countries. At present there is absolutely no agreement between key players on a number of fundamental norms in this area, including with regard to the use of economic instruments for political purposes, cyberviolations of critical infrastructure, manipulation of the social discourse and the use of spying for purposes other than informing political decision-makers. In the light of developments in this field in recent years, we do not expect this regime to improve. There is no doubt that political violence on Europe’s external borders – in the four regions of the Middle East, North Africa, the Sahel and the post-Soviet space – is having an impact on the international order. The internationalisation of intrastate conflicts in the Middle East, for example, contravenes the international legal order, while direct attacks on non-combatant civilians is an outright violation of the law of armed conflict. The analysis of five important international regimes – in the domains of state sovereignty, human rights, international humanitarian law, water management and freedom of maritime navigation – presents a chequered picture. First of all various regimes are being undermined. For example, not only the rules but also the norms in the field of fundamental human rights are under great pressure. The non-intervention rule is being systematically breached, even though the norm remains valid for now. Norms and rules in the field of water management and freedom of navigation – important for flow security – are increasingly recognised everywhere, despite the fact that water regimes in the Middle East and North Africa are leading to interstate friction. The analysis of the different regimes in the field of societal stability leads to a more mixed and somewhat more positive picture at state level than in the field of international peace and security (see Figure 6). There are new international initiatives with regard to migration, and there is a clear trend towards greater cooperation in the nexus between organised crime and terrorism, but cooperation within the EU is under pressure. The migration regime is developing under pressure from an unremitting global increase in migration and refugee flows. Despite the many non-state actors playing a role in this area, such as non-governmental organisations (NGOs), states remain dominant. On the one hand there are new norm-setting initiatives such as the Marrakesh migration accord. On the other hand there is opposition to this type of agreement in society. Partly for that reason, compliance with the rules is uncertain and usually voluntary. These trends in normative development with regard to migration are expected to continue in the years ahead. International cooperation focused on the nexus between terrorism and organised crime and the fight against it is, to put it mildly, not strong. Although the norms and rules are widely endorsed, there is little in the way of operational cooperation at multilateral level aside from incidental exchanges of information. The regime is largely organised in separate silos. Since this is increasingly being seen as an urgent problem, a number of new initiatives are in the pipeline for the years ahead in various multilateral forums aimed at defining the cooperation more precisely. Moreover, given the perceived urgency, there will probably be more agreement on and compliance with norms, rules and agreements. There is also a growing conviction that civil society must also be involved in tackling the nexus. The European Union is an example of a regime that is mature but at the same time still developing. The EU’s internal cohesion has been put to the test for a number of years by various developments within and outside the Union. Phenomena such as the global refugee crisis, the steady rise of populist sovereignism as a widespread social phenomenon in Europe, terrorism, the erosion of democratic rule of law in certain European countries and economic diversity are undermining pan-European solidarity and putting pressure on the Union in its current form. Various member states are seeking to scale back the EU’s supranational elements. 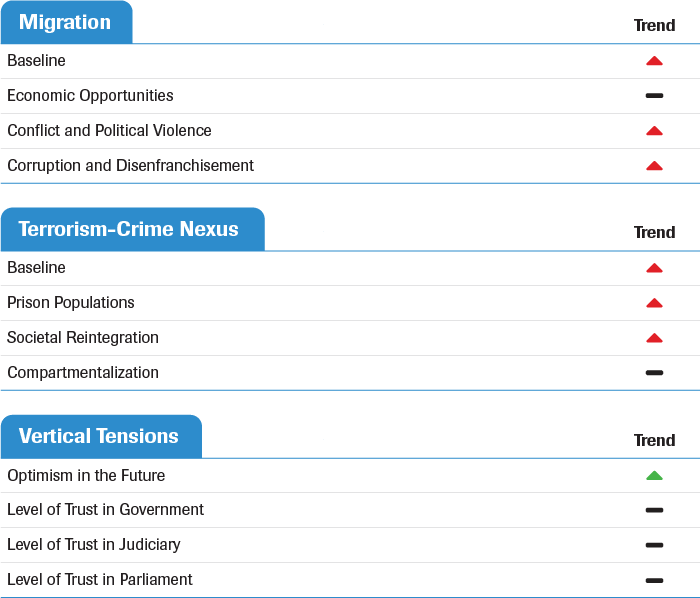 The analysis shows a wide range of vertical tensions in various policy areas within European society. These result from the prevailing differences, including between North and South (financial-economic themes), West and East (rule of law) and South and East (migration). Deeper EU integration is stagnating, although incremental advances are still being made in some areas, such as Banking Union, migration and defence cooperation. Compliance with European regulations shows a shift towards reduced cooperation, including with regard to Schengen, public finances and tax harmonisation. Europe is holding up as a democratic community of values, even if democratic values and norms are being undermined in certain member states. Finally, the pursuit of consensus is under pressure, both with regard to decision-making in specific fields and in a more generic sense. The trends in developments in the international order present a negative picture with regard to both international peace and security and societal stability. For all three sub-themes of interstate military competition, (Russian) political warfare and political violence on Europe’s external borders, the degree of cooperation in the international order is shifting towards increased conflict on norms and rules. The development of societal stability is somewhat more positive. In the sub-themes of migration and the nexus between terrorism and organised crime, the degree of cooperation in the international order is shifting towards more cooperation. We are seeing an opposite trend in the vertical tensions within the international order, with core elements of the European Union coming under pressure. What is the role and position of the Netherlands in bilateral relations, alliances, federations and international organisations? The Netherlands’ place in the web of international relations determines our country’s ability to protect its vital interests and project its national values. Major shifts have occurred in this global web in recent years. The US is retreating, undermining the post-war multilateral world order and sending mixed signals about the future of the transatlantic alliance. China is spreading its wings more determinedly, both in its own region and beyond. The European Union is under pressure, from the impending Brexit, the fractures between the West, East, North and South on key areas of policy and tensions between intergovernmental and supranational elements. In the meantime there is growing support in society for movements advocating a shift from the existing multilateral world order to a state-centric system.﻿ In this context middle powers, operating jointly or alone, can play an important role in shaping international regulation and policy. The Netherlands can be characterised as a middle power (see below). Middle powers can be identified on the basis of their capacities (power), the extent to which they get things done (influence) and the nature of their foreign policy (normativity). A common definition is “states that are neither great nor small in terms of international power, capacity and influence, and demonstrate a propensity to promote cohesion and stability in the world system”.﻿ With their relatively limited military capacities, middle powers cannot take on the full range of tasks and responsibilities of major powers in the international system. They are, however, able to pursue a normative foreign policy that serves not only their own vital interests but also those of a wider community, and in some cases even the global community. Distinctions can be drawn between developed and emerging middle powers on the basis of capacities (population size, GNP, military power), influence (diplomatic network and membership of important international organisations) and policy (contributions to the United Nations Development Program (UNDP) and their track record in human rights). This leads to a selection of 45 states, see Table 2. These states are geographically clustered in Europe, South America, the Mediterranean, the Middle East and Oceania. There are striking numbers of developed middle powers in South America and of emerging middle powers in the Middle East and Oceania. The Netherlands qualifies as a developed middle power on the basis of all these criteria. Middle powers play an important role in international regimes and regulation in peacekeeping, environmental protection, human rights, refugee aid and conflict control. The top 10, for example, provide 30% of the UN budget for peace missions and there are four middle powers (Bangladesh, Pakistan, Egypt and Indonesia) in the top 10 countries that supply most military personnel for these missions. In the field of environmental protection, middle powers are playing a central role in multilateral negotiations on the consequences of climate change and are responsible for developing many new initiatives in sustainable energy. Both established and emerging middle powers provide the largest financial contribution to human rights agencies in the UN, even more than the major powers. Established middle powers also make the biggest contribution to the UN refugee organisation, while the emerging middle powers take in the largest numbers of refugees. Finally, they support important initiatives in conflict prevention, facilitate activities behind the scenes and finance organisations and institutions that are very active in this field. This list underlines the fact that middle powers do not necessarily play a subordinate role in key international policy areas, but actually have an active and often also guiding role. The analysis shows that particularly established South American middle powers can be important partners in many of these policy areas, while the wealthy countries of the Middle East also make important contributions as emerging middle powers on subjects that are close to the Netherlands’ heart. It is precisely in policy areas where old and new middle powers share interests that partnerships and ad hoc coalitions can be forged. It is both interesting and relevant to examine the Dutch partnerships against the backdrop described above. The partners are countries with which the Netherlands maintains close links, in some cases codified in official treaties. The mutual relationships amount to more than the sum of the parts; the partners are instrumental in protecting and promoting vital Dutch interests and values. The Netherlands’ partners were identified and classified on the basis of the nature and intensity of economic, military and diplomatic relations. An assessment was also made of the extent to which countries share values in the protection of human rights. Finally there are also other reasons why countries can potentially be partners; these are unrelated to these dimensions, however, and are assessed on the basis of state visits. 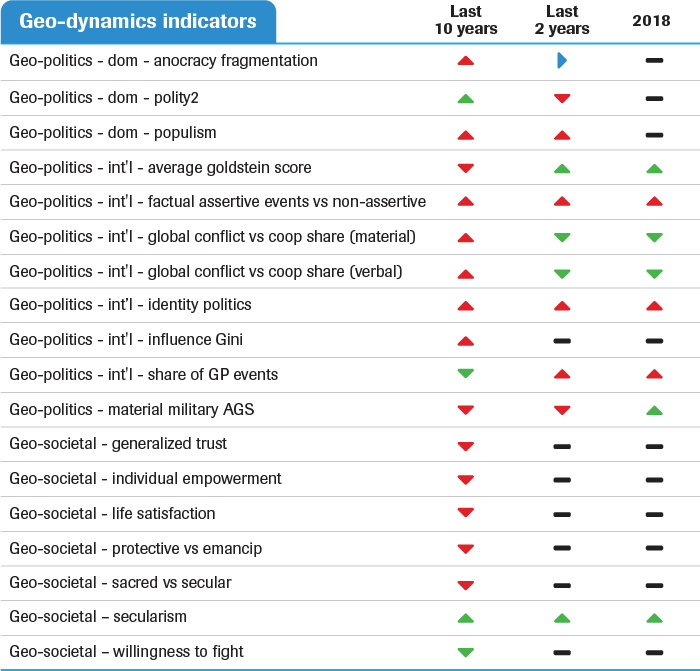 Every country in the world received a score for each of these criteria based on empirical data and was plotted on a five-point scale (0-4) to identify the Netherlands’ main partners (see Table 3). Our immediate neighbours Belgium and Germany are the main partners based on this measurement, followed by France, the United Kingdom, Italy, Spain, Poland, the United States, Luxembourg, Norway, Sweden, the Czech Republic, Denmark and Portugal. The Dutch partner countries are therefore predominantly in the European Union. The NATO partners Canada, Norway and the United States are also important partners in various fields. The Netherlands also has fairly good relations with Brazil, India, South Africa and China. The relations with South American countries are closer overall than those with African countries. In the last few years links have been strengthened particularly with Croatia, Myanmar, Albania, Colombia, Mexico and Montenegro. Relations with Hungary, Iran, Tajikistan and Turkey have deteriorated in recent years. It is striking that state visits have taken place from or to Egypt, Jordan, Oman, Qatar and the United Arab Emirates. These countries have relatively low scores in our index, but the Dutch government has seen fit to consider them important partners. The list of middle powers combined with this index of partners can be useful when considering whether to intensify relations with these countries. How will the EU develop in the years ahead? What support will there be for the EU in member states and how much cohesion will there be between them? These questions are relevant given the crisis which, according to many people, has already been weighing on the EU for several years (see also the section on vertical tensions in the international order chapter). These questions are discussed in this Strategic Monitor in the light of three external challenges that the EU faces and which will put (further) pressure on the Union’s internal cohesion and effectiveness in the years ahead: (1) migration in relation to the integration issue within member states; (2) relations with Russia; and (3) the transatlantic relationship with the United States. The first challenge concerns migration in relation to the integration issue within member states. In absolute numbers, the pressure of migration has fallen, in some cases sharply, partly due to the agreement with Turkey. Meanwhile the political situation on the EU’s southern borders has become so unstable that, as stated earlier, there is a real danger of a resurgence of the migration crisis. Migration pressure is likely to persist over the longer term given the demographic, economic and political developments in parts of Africa and the Middle East. Migration will also continue to weigh on relations between member states (both North-South and East-West), with the subject remaining a useful means of political mobilisation for populist parties in the member states. The instability on the southern flank also remains a particular challenge for the EU from the point of view of security policy, and it is notable that in parts of the affected regions the Union is currently unable to play a significant political role. The relationship with Russia, in the broader context of the eastern flank, poses a second challenge. Moscow is trying to prevent the EU acting as a power-political rival on the Eurasian continent. Aside from the situation in Eastern Ukraine, where there now appears to be a ‘frozen conflict’, the main political challenge lies in the policy of divide and rule and social subversion being pursued from Moscow, to which some member states are susceptible. A troubling aspect from a European perspective is that Russia is seeking particularly to strengthen its own influence in the Western Balkans. After Russia, China is adopting a similar approach, albeit perhaps in a more patient manner. By providing support and investments, including as part of the New Silk Road plan, China is playing the game of bilateral diplomacy, seeking to detach countries from their broader associations with the EU. Finally, US President Donald Trump poses a challenge to the EU on its western flank. Both with regard to security policy and in the economic sphere, the transatlantic relationship is under great pressure from the ‘America First’ policy. Just as troubling for the EU is the fact that President Trump is vocally distancing himself from the Union-backed concepts of multilateralism, international order and the rule of law, concepts which, after all, form the basis for European cooperation itself. The transatlantic relationship has been through previous crises and was ultimately always able to withstand them. Now, however, there is a greater distance between America and Europe in terms of the fundamental values which to a large extent characterise the post-war multilateral world order. The Union is thus being pulled in three directions from the outside. The European Union is likely to remain under constant pressure in the years ahead due to the continued crisis of confidence in member states and the lack of cohesion between them. This will have a major impact on the EU as a political system and particularly on the Union’s political leadership. This observation is significant given that the next five years may prove decisive for the continued existence of the EU in its current form, namely as a functioning system of extensive multilateral cooperation. External developments are also likely to have a major impact on the Union in the years ahead. They may have a positive effect in terms of awareness of individual member states’ vulnerability in a world of fundamental changes: a geopolitical wake-up call. Whether that will happen is uncertain. For the Netherlands major interests are at stake, both economically and politically. The Union has always been of vital economic interest for the Netherlands. But in a world of shifting tectonic plates, European cooperation in the broad sphere of security is growing steadily more important. NATO celebrates its seventieth birthday in 2019. Is it time for the Alliance to retire, or does it still have an active role to play? What developments are impacting the state of NATO? And, looking forward to 2024, what will the Alliance be like at that time? These are the questions discussed in this Strategic Monitor based on four challenges facing the Alliance: (1) the end of American dominance in the world and the rise of China as a new world power; (2) fundamental changes in the world order with a mix of multilateralism and polarisation (referred to as ‘multi-order’ in the 2017 Strategic Monitor); (3) increasing pressure on the maintenance of Western values and norms; and (4) the increasing complexity of threats. Let us first consider the end of American hegemony. Militarily the US remains number one in the world, and will continue to be so in the years ahead, although its military dominance will gradually wane due to the development of other powers’ new military capacities. In economic terms China will overtake the US, while other emerging countries will take a larger share of world production. President Trump’s ‘America First’ policy can be seen as a political response to globalisation and the crumbling power position of the US. But even if future presidents return to a less protectionist and nationalistic stance, the trend towards declining American dominance in global affairs will continue. This has implications for NATO. A weaker American role in world leadership, for example, will immediately complicate NATO’s direct involvement in crises outside Europe, particularly where regional powers resist American influences. The rise of China and other Asian countries on the world stage also implies a continued increase in the geostrategic importance of the Indian and Pacific Oceans. The American pivot to Asia is therefore driven by geopolitical and geoeconomic factors. A US military presence in Europe remains likely, however, as long as Russia poses a threat to European security. But at the same time Washington will have to deploy more military resources in the Pacific Ocean. Hence there is unlikely to be any let-up in American pressure on European countries to take greater responsibility for their own security, partly by shouldering a larger share of the transatlantic burden. A second challenge concerns ‘multi-order’. President Trump almost personifies the shift from multilateralism to polarisation with his antipathy towards the European Union, his critical stance towards NATO and his disregard for international organisations in general. ‘America First’ reinforces the polarisation and American support for NATO will be (even more) conditional than in the past. At the same time the continuing American military presence in Europe (see the recent sharp increase in the budget for American military forces in Europe) is an expression of solidarity in European and American geopolitical security. NATO is the organisation in which the US can exert influence on European security matters. Washington wants to maintain the Alliance as a channel to influence European security matters and impose better burden-sharing. The relationship between the US and Russia is of crucial importance for NATO. Although there are few signs of a structural improvement in these relations, new agreements in the military field are not ruled out, for example on strategic nuclear weapons. Another area for discussion could be confidence-building measures relating to military activities, so as to prevent incidents and risks of escalation. Third, Western values and norms are being challenged. The relative decline of the West on the world stage makes it more difficult to promote the traditional norms of individual freedom, democracy and the rule of law. Moreover, there is no longer only a schism between the West and the rest; there are three NATO member states (Hungary, Poland and Turkey) that are no longer seen as full democracies and where curbs on press freedom are increasing and the rule of law is under pressure. The impact of populist parties is also palpable in other European member states. Although these developments are mainly affecting the EU, they may also have consequences for cooperation within NATO. Turkey in particular is challenging the cohesion of the Alliance, both through its regional aspirations and military intervention in Syria and through the purchase of Russian arms, such as the S-400 air defence rocket system. The fourth challenge concerns the growing complexity of threats. NATO has to contend with a wide range of threats, from large-scale conflicts through to natural disasters in a dynamic environment. Most threat analyses show increasingly complex threats amid prevailing uncertainty. Technological developments in areas such as artificial intelligence and autonomous and hypersonic weapons are of benefit to NATO’s armed forces, but equally to those of potential adversaries. Technological progress also leads to ethical, moral and legal challenges. The fact that innovation and technological breakthroughs are currently being driven primarily by the civil sector simplifies access to new technologies. The so-called ‘grey zone’ between armed conflict and peace is another constant phenomenon. Both state and non-state actors will continue to pose a threat and the distinction between them may blur if some non-state actors develop into quasi-state actors. Finally, the risk of cyberattacks is also likely to increase further. NATO is therefore unlikely to be a harmonious alliance in 2024. American pressure on Europe to contribute more to its own defence, and hence to the sharing of burdens within NATO, will continue. Underlying trends point to a structural change in the transatlantic relationship. Europe will have to learn to cope with diminishing US dominance in the world, and as a result will probably have to bear more responsibility for its own security, even though militarily it cannot yet stand on its own two feet. On the other hand, there are no indications that the US will scale back its military presence in Europe. On the contrary, the US is likely to maintain its military presence in Europe as long as Putin’s Russia pursues its current anti-Western agenda. As in the Cold War, the key to transatlantic unity therefore ultimately lies in Moscow. First and foremost the principles of cooperation that underpinned the multilateral world order for many years are under pressure. This is due not least to a more exclusive view of self-interest on the part of the US, the most powerful player in this system. In key areas such as peace and security, military competition, arms control, free trade and climate policy, international cooperation is weakening and conflictive tendencies are rising. Freedom is declining in societies in various regions around the world. The situation with regard to peaceful conflict resolution has also deteriorated, the most obvious example being the internationalised civil war in Syria. With no dominant new principles of order replacing the old, the rise of China in particular is accompanied by the formation of new regimes whose governments play a more central role and in which there is less focus on the rights of the individual. There is also increasing division within societies. This is usually linked to confusion and uncertainty among citizens with regard to the future. This fuels vertical tensions that then impact international cooperation, within Europe but also outside. The acceptance, deepening and dissemination of liberal-secular values can no longer be taken for granted – either globally or in the West. This is evident among other things in the steady erosion of human rights regimes and in negative perceptions and emotions reported by people in global opinion surveys. But it also reflects a harshening of discourse both nationally and internationally. Assertive and even aggressive use of language, that would have been out of character among political leaders two generations ago, is increasingly seen as normal and commonplace. On the other hand a number of basic elements of the international order system still apply. Nation states continue to enter into agreements amid developments in the international legal order, so as to continue codifying prevailing norms into rules. This is increasingly done in cooperation with non-state and sub-state actors. International forums increasingly act as hubs providing vital mechanisms to regulate and coordinate state interaction and policy. Despite tensions within the EU and NATO on key themes, these organisations that are central to the Netherlands are by no means moribund. In short, we are witnessing a turbulent phase transition between two states of the global system that for now is occurring within the same systemic design. On the basis of this year’s results, summarised in this synthesis report and considered in greater detail in the 15 in-depth studies, the following conclusions can be drawn. Threat assessment is predominantly negative. External developments are leading to actual threats to the Netherlands’ vital interests and values. Threats to the national legal order and public security are a consequence of cyberattacks and the spreading of disinformation as part of Russia’s political warfare, as well as the nexus between terrorism and organised crime. The international legal order is threatened by interstate military competition, political violence on Europe’s periphery and sustained irregular migration and refugee flows. Finally, economic prosperity is threatened by difficult relations in the EU combined with social tensions within the EU member states. These are interacting with each other and appear to be mutually reinforcing. Slightly negative trend in the threat assessment. Rather than improving, this threat assessment is expected to deteriorate in the years ahead. One of the main reasons for concern is that important driving forces, such as rapid technological innovation, the rise of China, Russia’s political economy, American foreign policy and a divided European Union, do not look set to deviate fundamentally from their current trajectory. It is also worrying that the Netherlands is unable to exert much influence on these driving forces and must therefore concentrate on anticipating the trends and the resulting threats. The role of states such as Russia and China, which are key protagonists in the nexus between international and external security, is striking. Since they play a role in many of the identified risks, they will also have to be part of any solutions. Decline of international cooperation. International cooperation in the areas of international peace and security and societal stability is declining. Here we are broadly seeing a shift from cooperation towards conflict, with the rules being systematically violated and underlying norms blurring. A shift from multilateral cooperation to polarised competition is evident in most of the regimes under review. This shift is consistent with observations in previous editions of this Strategic Monitor, but is now even more pronounced. Continuing friction in the international order. The forecast for the international order is that this picture will not change in the period ahead. Given the long-term trends on the one hand and the prevailing geopolitical forces on the other, the friction affecting rules and norms in the various policy areas seems unlikely to diminish. Conflicting geodynamic developments. Various conflicting dynamics can be observed, consistent with a phase transition. Such transitions can be extremely turbulent. The previous Strategic Monitor referred to a possible calm before the storm. A year on, the storm has not yet broken, but a storm warning remains in force. Building on the concept of multi-order, a hybrid and fluid world order is expected for the years ahead which, depending on the particular subject, shows characteristics of multilateral, polarised, networked and fragmented worlds, but, as stated earlier, with increasing dominance of polarised characteristics. More important role for middle powers. In this multi-order middle powers are playing a more important role, including as guardians of the legal order. Where the major powers fail to act in concert and frequently clash, middle powers are well placed to conduct a normative foreign policy that can serve not only their own vital interests but also those of a wider community, and in some cases even the global community. What implications do the developments described and analysed above have for Dutch foreign and security policy? The answer to this question is ultimately down to politics. Choices concerning the (relative) importance of the threats and opportunities, the appropriate policy and the means used to implement the policy are, after all, political in nature. But in the Strategic Monitor it is fitting to draw a number of conclusions from the acquired insights that can inform the political decision-making process. Existing and new frameworks for security policy. The Netherlands relies first and foremost on transatlantic cooperation for its security and stability. NATO thus remains for now the cornerstone of Dutch security and defence policy. There is simply no available alternative. Further cooperation in the security area in bi-, tri- and multilateral European contexts will be above all complementary in the forthcoming years. Although the EU and NATO remain the primary arenas for promoting Dutch interests, international developments also make it necessary to seek new partnerships in the world outside these frameworks. Coalitions with other middle powers. Particularly in policy areas where middle powers share interests and values, partnerships and ad hoc coalitions can be forged, for example in peacekeeping, environmental protection, human rights, refugee aid and conflict control. It is perhaps time to see how groups of countries such as MIKTA (Mexico, Indonesia, Korea, Turkey and Australia) or CIVETS (Colombia, Indonesia, Vietnam, Egypt, Turkey and South Africa) can be mobilised to support global cooperation in policy areas where the major powers cannot find a solution. An important point in this regard is the direction of foreign policy pursued by the emerging middle powers and whether they (1) support the multilateral order; (2) undermine it by acting as spoilers; or (3) play the major powers off against each other and form ad hoc coalitions. In any event, developed and emerging middle powers can play a decisive role in designing the rules of the international system. International legal order is under pressure, but remains important. In a more polarised world order the norms and rules of the international legal order will be more often violated than before, fuelling calls to bolster this legal order. Tensions and conflicts between countries – such as Syria, where states such as Russia and Iran are playing a prominent military role with different value frameworks and interest agendas – create an extremely complex playing field in which to promote these norms and rules. That is a major challenge for the years ahead: how to promote international order and stability, at a time when the scope to do so is more limited than in the past. Robust and broadly based security policy. In this security environment there is increasing emphasis on protecting and promoting the Netherlands’ own interests, including territorial defence of Dutch territory (together with the Caribbean parts of the Kingdom), allied territory and economic prosperity. In that regard the deployment of capacities generally considered ‘hard’ is just as important as the deployment of ‘softer’ capacities. Take flow security, for example, which concerns the physical and virtual protection of the various lines of communication (LOCs) on land, at sea, in the air, in space and in cyberspace. That requires on the one hand robust military capacities in these various domains that enable the Netherlands to proactively prevent threats, deter possible opponents or, jointly with allies, defend itself against malicious disruptions, particularly within Europe and on Europe’s external borders. On the other hand, flow security is also promoted by the international legal guarantees of flow security in international regimes with appropriate norms and rules. International law thus not only constitutes a goal in itself, but is also of major instrumental importance. This connection between defence, diplomacy and other state instruments applies equally in other fields – from development cooperation and conflict prevention through to arms control and hybrid conflict. A robust and broadly based security policy is essential in this context. Complex threats require synergistic responses. Finally, many of the threats identified here once again underline the interconnectedness and multidimensionality of the threat assessment – characteristics that have already been frequently observed in Dutch government documents over the past decade.﻿ Threats resulting from Russian political warfare, political violence on the external borders and vertical tensions within society are interlinked and interact with each other. That high interconnectedness of security threats requires a policy in which different instruments of state power are deployed synergistically, not only in the nexus between internal and external security, but also across the different policy areas. Advisory Council on International Affairs. “De toekomst van de NAVO en de veiligheid van Europa. Samenvatting, conclusies en aanbevelingen”, 10 November 2017. link. Bauman, Zygmunt. “Times of Interregnum”. Ethics & Global Politics 5, no. 1 (2012): 49–56. Bruijne, Kars de. “Policy Brief. Vitale belangen”. Policy Briefs. Clingendael, August 2018. link. Daalder, Ivo H., and James M. Lindsay. “The Committee to Save the World Order”. Foreign Affairs, 30 September 2018. link. ———. The Empty Throne: America’s Abdication of Global Leadership. New York: Hachette Public Affairs, 2018. De Spiegeleire, Stephan, Clarissa Skinner, Tim Sweijs, Mateus Mendonça Oliveira, Rianne Siebenga, Frank Bekkers, Nicholas Farnham, et al. The Rise of Populist Sovereignism: What It Is, Where It Comes from, and What It Means for International Security and Defense. The Hague, the Netherlands: The Hague Centre for Strategic Studies, 2017. link. De Toekomst in Alle Staten. HCSS Strategische Monitor 2013. 20|03|13. The Hague, the Netherlands: The Hague Centre for Strategic Studies, 2013. link. “Democracy in Crisis: Freedom House Releases Freedom in the World 2018”. Freedom House, 16 January 2018. link. Deudney, Daniel, and G. John Ikenberry. “Liberal World: The Resilient Order”. Foreign Affairs 97, no. 4 (August 2018): 16–24. Development, Concepts and Doctrine Centre. “Global Strategic Trends: The Future Starts Today”. Ministry of Defence UK, October 2018. link. DiGiulio, Sarah. “Gallup Data Says Our Emotions Hit a Decade-Low in 2017. Here’s What Psychologists Say We Should Do about It”. NBC News, 27 October 2018. link. Duncombe, Constance, and Tim Dunne. “After Liberal World Order”. International Affairs 94, no. 1 (1 January 2018): 25–42. link. Etzioni, Amitai. “The Rising (More) Nation-Centered System”. The Fletcher Forum of World Affairs 42, no. 2 (Summer 2018). link. Flow Security and Dutch Defense and Security Policies. The Hague, the Netherlands: The Hague Centre for Strategic Studies, 2018. link. Gallup, Inc. “2018 Global Emotions”. Gallup, Inc., 2018. Gramsci, Antonio. Selections from the Prison Notebooks. London: The Electric Book Company Ltd, 1999. Haass, Richard N. A World in Disarray: American Foreign Policy and the Crisis of the Old Order. Penguin Press, 2018. “Horizonscan Nationale Veiligheid 2018”. The Hague, the Netherlands: Analistennetwerk Nationale Veiligheid, RIVM (National Institute for Public Health and the Environment), October 2018. link. Ikenberry, G. John. “The End of Liberal International Order?” International Affairs 94, no. 1 (1 January 2018): 7–23. link. ———. “The Future of Multilateralism: Governing the World in a Post-Hegemonic Era”. Japanese Journal of Political Science 16, no. 03 (September 2015): 399–413. link. Jordaan, Eduard. “The concept of a middle power in international relations: distinguishing between emerging and traditional middle powers”. Politikon 30, no. 1 (1 May 2003): 165–81. link. Kissinger, Henry. World Order. Penguin Books Reprint edition, 2015. Klem, Martijn, and Johannes Kester. “Het buitenlandse beleid van middelgrote mogendheden. Verkennende studie voor het WRR-rapport 86 Aan het buitenland gehecht”. Web publication. The Hague: The Netherlands Scientific Council for Government Policy, January 2011. Krasner, Stephen D. “Structural Causes and Regime Consequences: Regimes as Intervening Variables”. International Organization 36, no. 2 (1982): 185–205. Kundnani, Hans. “What Is the Liberal International Order?” Policy Briefs. German Marshall Fund, 3 May 2017. link. Luce, Edward. The Retreat of Western Liberalism. New York: Atlantic Monthly Press, 2018. Mazarr, Michael, Astrid Cevallos, Miranda Priebe, Andrew Radin, Kathleen Reedy, Alexander Rothenberg, Julia Thompson, and Jordan Willcox. Measuring the Health of the Liberal International Order. Santa Monica, CA: RAND Corporation, 2017. link. Meckler, John. “A New Abnormal: It Is Still 2 Minutes to Midnight. 2019 Doomsday Clock Statement”. Bulletin of the Atomic Scientists. Consulted on 30 January 2019. link. Ministry of Foreign Affairs. “Notitie Geïntegreerde Buitenland- en Veiligheidsstrategie (GBVS)”, 14 May 2018. link. Ministry of Defence. “Defensienota 2018 - Investeren in onze mensen, slagkracht en zichtbaarheid”. Beleidsnota. The Hague, the Netherlands, 26 March 2018. link. ———. “Eindrapport Verkenningen. Houvast voor de krijgsmacht van de toekomst (bijlage bij 31243, nr. 16)”. The Hague, the Netherlands, 31 March 2010. link. Ministry of Justice and Security. “Documenten Strategie Nationale Veiligheid”. Web page, 13 November 2018. link. “Multi-Order: Clingendael Strategic Monitor 2017”. Strategic Monitor. Clingendael. Consulted on 30 January 2019. link. “Munich Security Report 2018: To the Brink - and Back?” Munich Security Conference, 2018. link. NCTV. “Strategie nationale veiligheid”, 2007. link. “Phase transitions and critical phenomena - Latest research and news”. Nature. Consulted on 27 June 2018. link. Pinker, Steven. The Better Angels of Our Nature: Why Violence Has Declined. Penguin Books Reprint edition, 2012. Pronk, Danny. “Strategic Alert. Hybrid Conflict and the Future European Security Environment”. Strategic Monitor 2018. Clingendael, September 2018. link. Rachman, Gideon. Zero-Sum Future: American Power in an Age of Anxiety. Simon & Schuster, 2012. Rose, Gideon. “Which World Are We Living In?” Foreign Affairs, August 2018. link. “Strong trade growth in 2018 rests on policy choices. Press/820 Press Release”. World Trade Organization, 12 April 2018. link. Thränert, Oliver, and Martin Zapfe, ed. Strategic Monitor 2018. Key Developments in Global Affairs. Center for Security Studies, ETH Zurich, 2018. link. Tiekstra, Willemijn. “Strategic Alert. The Future of the European Migration System: unlikely partners?” Strategic Monitor 2018. Clingendael, July 2018. link. Ulfelder, Jay. “Global: More Democracy, Less Freedom”. Koto, 19 January 2018. link. US National Intelligence Council. “Global Trends 2018: Paradox of Progress”. Global Trends. Office of the Director of National Intelligence, 2017. link. Wijk, Rob de. De nieuwe wereldorde. Amsterdam, the Netherlands: Balans, 2019. link. World Economic Forum. The Global Risks Report 2018, 13th Edition. Geneva, Switzerland, 2018. link. “WRR-rapport nr. 98: Veiligheid in een wereld van verbindingen. Een strategische visie op het defensiebeleid”. Netherlands Scientific Council for Government Policy, 10 May 2010. link. Zakaria, Fareed. “The Rise of Illiberal Democracy”. Foreign Affairs 76, no. 6 (December 1997): 22–43. See inter alia Ikenberry, “The End of Liberal International Order?” although he does see a future for the liberal international order, albeit in a different form. See also the authors cited in Duncombe and Dunne, “After Liberal World Order”, 26–28. See also de Wijk, De nieuwe wereldorde. See also Luce, The Retreat of Western Liberalism; Haass, A World in Disarray; Zakaria, “The Rise of Illiberal Democracy”. Rachman already warned about this earlier in this decade, see Rachman, Zero-Sum Future: American Power in an Age of Anxiety. See Kissinger, World Order, Introduction chapter. See also de Wijk, De nieuwe wereldorde, 56–61. See for example Mazarr et al., Measuring the Health of the Liberal International Order, 22–23. As we reported in the previous Strategic Monitor, the RAND researchers examined the “health of the multilateral world order” on the basis of 18 indicators. For 14 (!) of those 18 indicators they found an increase and an improvement in international cooperation, including in the field of military alliances, non-proliferation, development aid, peace missions and peaceful conflict resolution. The researchers stressed the need for caution, given the data time lag and the possibility that recent developments may have marked a tipping point. See also our chapters on Geodynamics and the international order in this Strategic Monitor. World Economic Forum, The Global Risks Report 2018, 13th Edition. Gallup, Inc., “2018 Global Emotions”; DiGiulio, “Gallup Data Says Our Emotions Hit a Decade-Low in 2017. Here’s What Psychologists Say We Should Do about It”. Gramsci, Selections from the Prison Notebooks, 556; Bauman, “Times of Interregnum”. “Phase transitions and critical phenomena - Latest research and news”. See “Democracy in Crisis”; Ulfelder, “Global: More Democracy, Less Freedom”. “Strong trade growth in 2018 rests on policy choices”. Pinker, The Better Angels of Our Nature. See also Deudney and Ikenberry, “Liberal World”. For this see the Clingendael report “Multi-Order: Clingendael Strategic Monitor 2017”. These in-depth studies are publicly available on the two online platforms of HCSS and Clingendael: link and: link. For an explanation see Drent and Meijnders (ed. ), “Horizonscan Nationale Veiligheid 2018”. 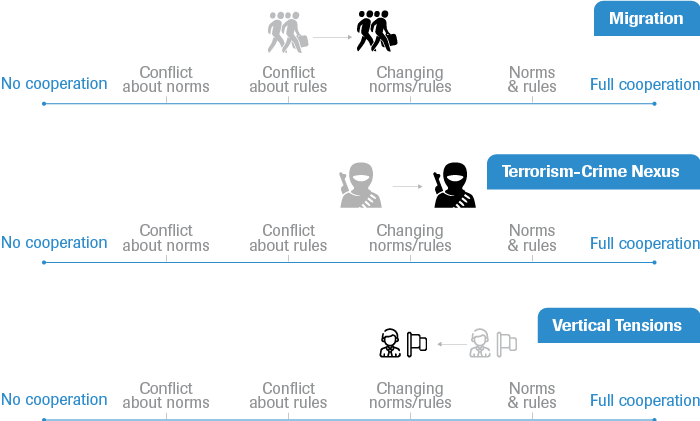 These world views were originally developed as scenarios for and presented in Ministry of Defence, “Verkenningen: Houvast voor de krijgsmacht van de toekomst” and since then they have been used as a constant reference framework in the previous seven editions of the Strategic Monitor (2012 to 2018). These scenarios are also used in Development, Concepts and Doctrine Centre, “Global Strategic Trends: The Future Starts Today”. In “Global Trends 2018: Paradox of Progress” the US National Intelligence Council uses a scenario framework with three comparable but alternative world views. In “Verkenningen” referred to above this world view is still referred to as multipolar. But multipolar describes the number of poles of power in the system, not the nature of the system. In other words, multilateralism can also reign supreme in a multipolar system. We therefore call this world view polarised. See also the HCSS report Flow Security and Dutch Defense and Security Policies. For a more detailed trend analysis see: Pronk, “Strategic Alert. Hybrid Conflict and the Future European Security Environment”. Etzioni, “The Rising (More) Nation-Centered System”. For populist sovereignism, see De Spiegeleire et al., The Rise of Populist Sovereignism. Klem and Kester, “Het buitenlandse beleid van middelgrote mogendheden”, 9. Daalder and Lindsay, “The Committee to Save the World Order”. These countries are the United Kingdom, France, Germany, Italy, Australia, South Korea, Japan, Canada and the European Union. Jordaan, “The concept of a middle power in international relations”. De Toekomst in Alle Staten, 9, 71. The Munich Security report entitled To the Brink - and Back? discusses the erosion of the international order, the decline of freedom and the rise of nationalistic reflexes, see inter alia the introduction to the “Munich Security Report 2018: To the Brink - and Back?”. See also Thränert and Zapfe, Strategic Trends 2018. Key Developments in Global Affairs, in which the introduction refers to a fragmenting world. See also the Foreign Affairs compendium entitled “Which World Are We Living In?”, which combines various visions, discussing both positive developments (such as those in the Geodynamics chapter) and negative developments and the risks that result from them. See also the opinion of the Advisory Council on International Affairs on the future of NATO and the security of Europe, which discusses the fragility of the relationship within the alliance in the face of the complex security environment: Advisory Council on International Affairs, “The Future of NATO and European Security”; and the report of the Netherlands Scientific Council for Government Policy entitled “Veiligheid in een wereld van verbindingen” (Security in a Connected World), which focuses on a changing and particularly also deteriorating security situation. See also the National Security Profile scan: “Horizonscan Nationale Veiligheid 2018” (National Security Horizon Scan 2018). See also the Bulletin of the Atomic Scientists that monitors existential risks to humanity as a result of nuclear weapons and climate change in its ‘Doomsday Clock’ and warns that it is ‘two minutes to midnight’, Meckler, “A New Abnormal: It Is Still 2 Minutes to Midnight”. Key Developments in Global Affairs, in which the introduction refers to a fragmenting world. See also the Foreign Affairs compendium entitled “Which World Are We Living In?”, which combines various visions, discussing both positive developments (such as those in the Geodynamics chapter) and negative developments and the risks that result from them. See also the opinion of the Advisory Council on International Affairs on the future of NATO and the security of Europe, which discusses the fragility of the relationship within the alliance in the face of the complex security environment: Advisory Council on International Affairs, “The Future of NATO and European Security”; and the report of the Netherlands Scientific Council for Government Policy entitled “Veiligheid in een wereld van verbindingen” (Security in a Connected World), which focuses on a changing and particularly also deteriorating security situation. See also the National Security Profile scan: “Horizonscan Nationale Veiligheid 2018” (National Security Horizon Scan 2018). See also the Bulletin of the Atomic Scientists that monitors existential risks to humanity as a result of nuclear weapons and climate change in its ‘Doomsday Clock’ and warns that it is ‘two minutes to midnight’, Meckler, “A New Abnormal: It Is Still 2 Minutes to Midnight”. Ministry of Foreign Affairs, “Notitie Geïntegreerde Buitenland- en Veiligheidsstrategie (GBVS)”; Ministry of Defence, “Defensienota 2018 - Investeren in onze mensen, slagkracht en zichtbaarheid”. In addition to the security documents of the Ministries of Foreign Affairs and Defence, see for example the National Coordinator for Security and Counterterrorism (NCTV), “Strategie nationale veiligheid” (National Security Strategy); and the Ministry of Justice and Security, “Documenten Strategie Nationale Veiligheid” (National Security Strategy Documents) that have been published on this subject by the Ministry of the Interior and the Ministry of Justice and Security.